When you work full time at an office, sometimes you have to get creative in the kitchen. I have a hard time going the full Sandra Lee, but lately we’ve been looking for some sort of compromise between certain Kraft and “Helper” products, and the super yummy made from scratch mac n’ cheese they have at places like Haven Gastropub. I actually keep meaning to make some “from scratch” mac n’ cheese, but keep not having the time or the money to experiment with a new recipe. Turkey dogs – Edible. David and the little on like this combo, although I’m not a huge fan of the texture of big chunks of hot dog in my m&c. Ground Turkey – Pretty tasty and filling. I add some chipotle pepper to give it some kick. Maybe some Italian seasoning if I have some on hand. Buffalo Sausage – this is one of those “it sounded good at the time” combos. The sausage itself was really good… if you like buffalo, which I do, but David and the little one both find it too gamey for their taste. But mixing it in with the pasta didn’t go so well. The meat is just way too lean and dry. 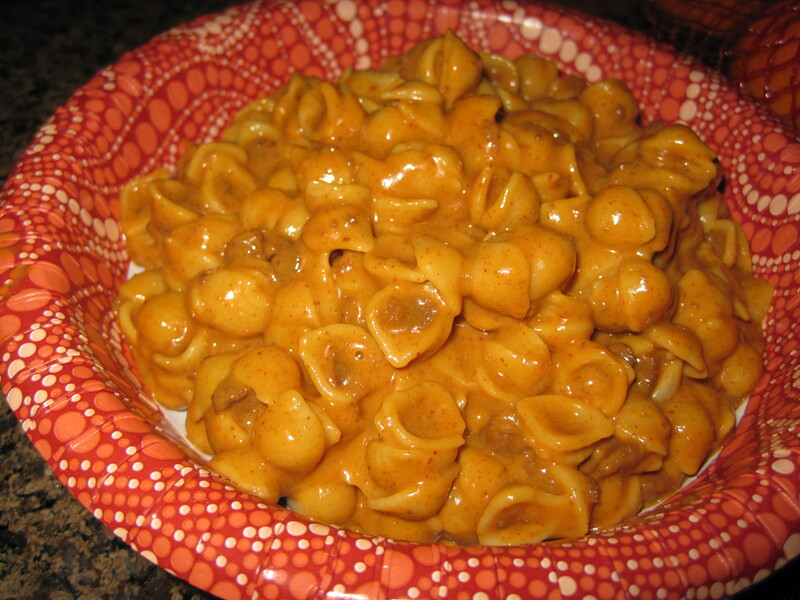 Ground Beef – Throw in a bit of tomato paste and some italian or taco seasoning and you have… Hamburger Helper! More or less. This is the original mash up, which my grandma used to make for the kids back in the day when she didn’t feel like cooking from scratch. Applewood Smoked Bacon – the winner, hands down. We got some of this from the butcher area at Whole Foods and it was awesome mixed in with a box of Anne’s. I’m really itching to try it in a from scratch version with a sauce involving guyere, romano and parmesan. At least that’s the plan at the moment.